When it comes to injuries, no matter what the sport, and no matter who you support, there is no fair-minded supporter or fan that likes to see them happen to anyone. Injuries are part of sport, that is not a controversial statement. If you push your body far enough and hard enough, someone, somewhere, is going to get hurt. While I have my own theory on the rise of anterior cruciate ligament injuries (in terms of why we are seeing so many of them), one thing that will never cease to amaze me is how in the age of billion-dollar sports industries we ever witness equipment-related injuries. Specifically, injuries caused by the playing field. I have every sympathy in the world for Kevin Muscat. 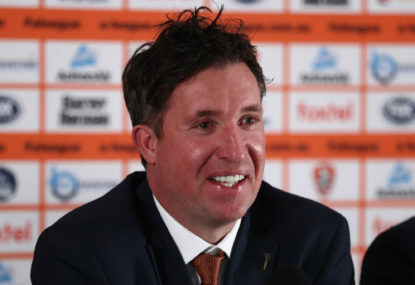 For a world-class domestic football league to be expected to be played on a cricket pitch surface that had hosted a rugby league match a mere two days earlier, football should not be accepting that. 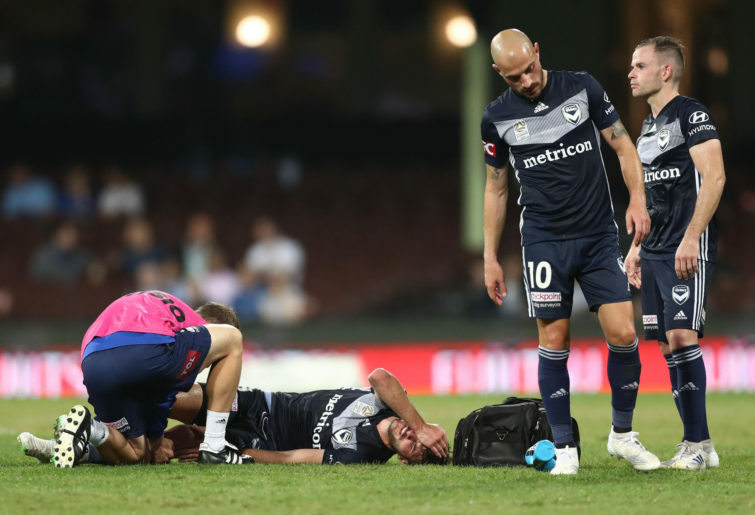 As we await confirmation of the extent of the injuries that Terry Antonis has suffered, the fears were the worst. And if those fears turn out to be the case, the SCG Trust and the FFA have a lot to answer to. Over the years, I have watched in astonishment as the likes of NRL players twisted their knees in Suncorp Stadium turf, or AFL players fell in a heap (still) at the closed stadium in Melbourne. For all the money that gets spent on sport, how any professional sport is ever played on a field that offers even a hint of causing injury is beyond me. And yet here we are in 2019 and Terry Antonis is praying for good news, but if there is any damage of any sort in Antonis’ knee his season is over. Meanwhile, Melbourne Victory are trying to balance Asian Champions League football with defending their championship, and they have just lost a key plank in their championship-winning midfield. No, Muscat is right, as a code, in fact, any code, unsatisfactory fields should not be accepted. And this is not even a football issue, this is a sporting issue. The AFL are monitoring the SCG pitch for the upcoming Thursday match between the Swans and the Demons, and it will be interesting to see what ends up happening with the scheduling of that match if the SCG surface is not up to scratch. If it is okay for the AFL to cancel games over surface disputes, then the FFA would want to take note. But when it comes to playing surfaces in general, the way modern administrators run games and accept whatever playing field is served up, you’d be forgiven for thinking it was 1919, not 2019. 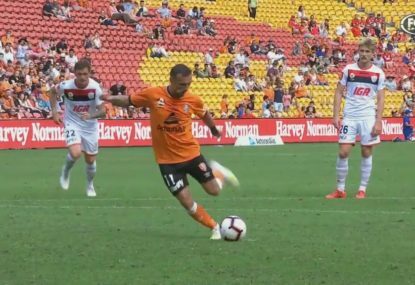 A mere five days after laying the boot into the boredom that is dished up by Warren Joyce (and I stand by those comments), he sent out his side against Brisbane on Friday and we saw City playing as if they were Barcelona. Joyce has been pragmatic in his coaching this season, and has placed an emphasis on staunch defence over free flowing attacking play. Now, there is no amount of irony lost on me that it was a defender who scored the first of City’s goal of the season contenders, with Rory De Laet hitting a strike of such swerving and quick ferocity that the likes of Jamie Young would have immediately been thinking to himself: oh no. But just to show that De Laet’s supreme strike was no one-off, Riley McGree, he of the world-renowned scorpion that lit up the internet last year, capped off Melbourne’s performance with a curling, looping, speccy from the edge of the area, that would have had Jamie Young immediately thinking to himself: oh no, not again. When you add in the own goal to boot, City scored all the night’s goals. Look, who am I to question what Manchester United taught Warren Joyce should be doing in a professional domestic league? He has the credentials, he gets paid to make the decisions. 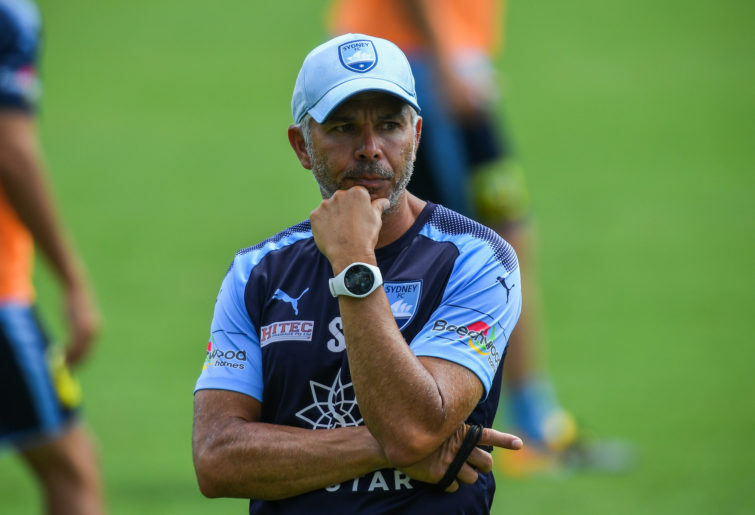 But anybody with a peripheral interest in the A-League can tell you that last week City shut up shop and got taught a lesson, while this week, it appeared to be a case of lesson learned, and they did a bit of teaching themselves. You have to wonder what is going through the minds of the Newcastle Jets and their supporters sometimes. 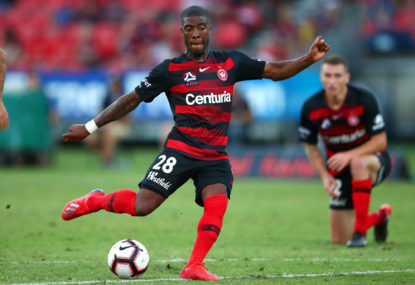 Coming into this round, seven points outside the top six with four games to go and seeing Melbourne City win on Friday night, the Jets were effectively out of finals contention as they came up against an in-form Wanderers outfit. And then, nanoseconds before half-time, as Rashid Mahazi had headed the away side into a much deserved one-nil lead, the Jets were looking down the barrel of a third straight loss and eighth place. So perhaps the most frustrating part about the Jets’ second-half showing, as has been the case all season, is that after three second-half goals, all of which stood up to scrutiny in terms of quality, you couldn’t help but ask: where has this been for the rest of the season? O’Donovan’s finish was calm, Petratos’ goal (or Janjetavic’s own goal) was a mix of luck and class, while Angus Thurgate’s winner (and first in the A-League) was with a coolness beyond his years. The Jets have disappointed for the majority of the season, and for mine, their season ended the moment they lost a game that was the Mariners’ second win for the season. 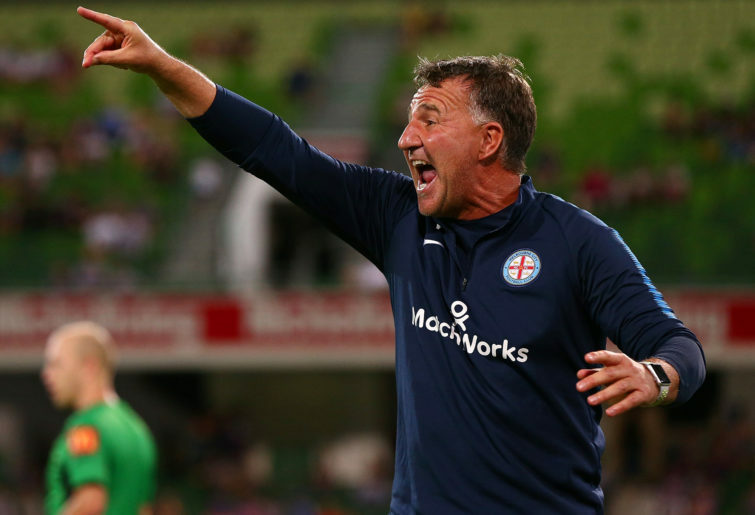 Ernie Merrick has a lot to think about in this coming off-season, and hopefully the Jets recruit to allow for his methods to come to their full fruition. But for the Jets’ supporters against the Wanderers on Saturday, with Joey Champness and Thurgate leading the way, there may be some insight into what Merrick’s vision looks like. As for now though, the Jets technically are not yet out of the finals race, but they may as well be. All that remains is hope, and sometimes, that can be the hardest part. It is a curious little historical anomaly in the A-League that the team that finishes second on the premiership ladder has always gone on to appear in the grand final. So when last-minutevic’s last minute winner hit the back of the net, it was advantage Sydney in the race for locking up top two. And while cutting the gap to Perth down to just one win, they put the pressure back on the Western Australians in what otherwise appeared to be a procession for the Glory to the premiers plate. 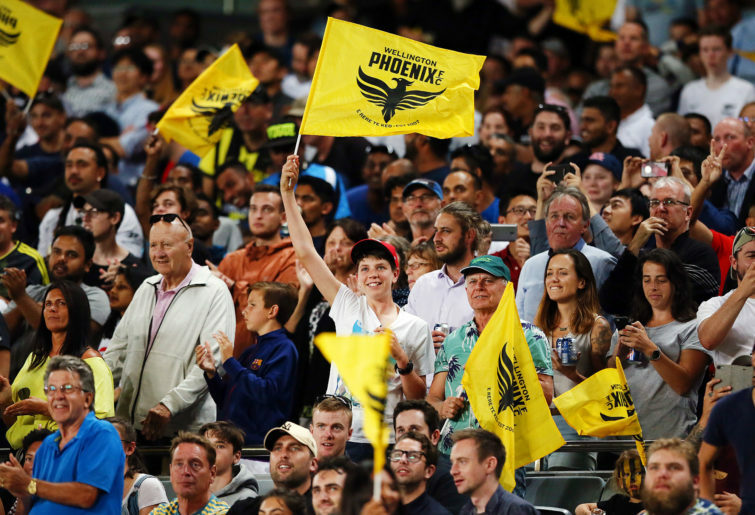 Three more rounds to go, at least one finals appearance for Sydney, there is plenty to play out this season, and they have consistently spent season 2018-19 frustrating as much as they have astounded. The proof is always in the pudding, however, and a top two finish is proof of a tasty pudding indeed. Remember, this was supposed to be the season when Sydney FC bottomed out and began a re-build. Steve Corica instead seems to have his team firing at just that time of the season when championships are won and lost. Now, as Victory showed last year, a top two finish does not guarantee a championship, and if any team won’t lose sleep over finishing outside the top two, it is Muscat’s team. But teams looking to win, possibly even host, a grand final, would sleep a lot easier finishing in spots one or two. And the race for fourth remains on fire. Truth be told, Wellington visiting Adelaide was always going to be a tough one to pick, given that Wellington historically have difficulty travelling, an Adelaide this season have been woeful at home. The match was going to be a case of whose bad record would weigh heaviest. Adelaide ended up winning the battle of the fourth over the Phoenix, quite comfortably in the end, and it genuinely surprised me when I looked at the table that each team is currently sitting on ten wins, seven losses, seven draws. I would have bet good money on Wellington having more wins, but perhaps Adelaide had picked up more draws. With three rounds to play, Wellington by no means have an easy run, travelling to Brisbane next week, and then hosting Melbourne City and finishing the season hosting Perth in the third Distance Derby. Adelaide will also play Brisbane, away, in the last round of the season, after travelling to Melbourne to play City and hosting the Victory. Neither team has an easier draw than the other. All the more reason why the Round 24 result between these two teams was crucial. Wellington could have put some space between themselves and fifth, but now have to fight to the death. Adelaide may have given up on the hopes of hosting a final, but instead, live to fight another hosting day. Absolutely no surprises that Perth head home to get themselves ready for Round 25 with a comprehensive dismantling of the Mariners and a 3-nil win in the bag. Whatever you think about how well Perth are going, those two losses that the Central Coast have garnered this season truly is astonishingly dreadful. Perth, at the moment, have accumulated five times the number of points, over seven times as many wins as their bottom dwelling Mariners counterparts. Alen Stajcic, no doubt, has his work cut out for him. But funnily enough, as he laments the failure against the table-toppers, he actually does not need to look too far away than the coach sitting on the other bench, one Tony Popovic, for an idea about how to turn a team around. 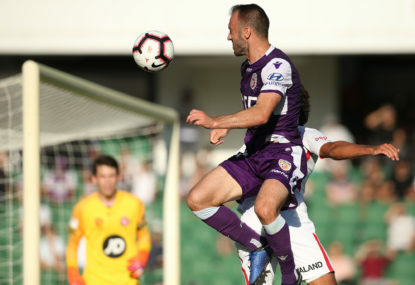 Perth were finals also-rans when Poppa took over, and he has them purring as premier heirs apparent, and readying them for a championship tilt. Talking points certainly is not saying that Stajcic can turn the Mariners into premiership contenders in one off-season. Of course, Poppa at least should give Stajcic some hope that a little bit of discipline, and a coach who can talk to his players, can still work wonders.